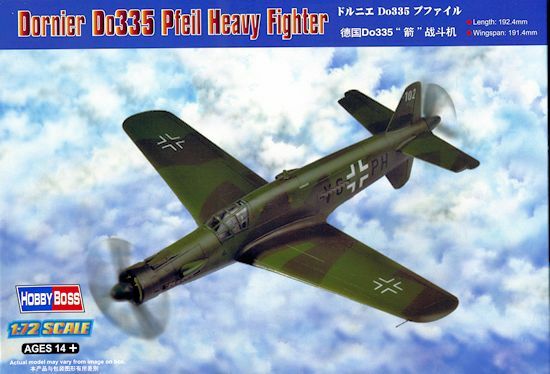 The Dornier Do 335 Pfeil ("Arrow") was a World War II heavy fighter built by the Dornier company. The two-seater trainer version was also called Ameisenbär ("anteater"). The Pfeil's performance was much better than other twin-engine designs due to its unique "push-pull" layout and the much lower drag of the in-line alignment of the two engines. The Luftwaffe was desperate to get the design into operational use, but delays in engine deliveries meant only a handful were delivered before the war ended. This is one of a new line of twins in the Easy Assembly series from Hobby Boss. The Do-335 is most welcome in this line of kits and should prove to be popular. As is the norm with these kits, the wing is a single piece with the lower fuselage incorporated into it. Thanks to slide mold technology, the upper fuselage is a single piece as well. There is a small cockpit that has a seat, stick and floor. 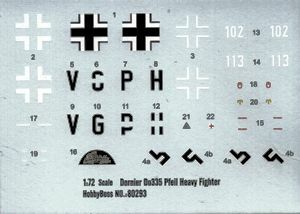 The instrument panel is a decal that fits into the upper fuselage section. Scoops and exhausts are separate and can be added later. The rear fit insertion is also separate and is molded along panel lines. There is a single clear canopy and without the huge mounting tabs we've seen on earlier kits. I know I appreciate that. Landing gear are nicely done with the main gear having separate oleo scissors, retraction struts and wheels. The front strut has the wheel molded in place. with separate struts. HB seems to make one glitch in each of its EA kits and in this one it is the props. Basically the props are turning the wrong way. Now one could probably just switch the front and the rear prop and mount them backwards (after a bit of modification to the shafts) were it not for the fact they are different sizes. Adding to this is the deal that the blades are actually airfoil shaped so would have the flat part at the 'front'. Looks like a job for aftermarket. Instructions are well done with Gunze paint references. There are markings for one aircraft, the lone surviving Do-335 that is held by the Smithsonian and is now in their collection at the Dulles airport. This aircraft was completely rebuilt by Dornier in Germany and allowed to be displayed in Germany for ten years before being returned to the US. In addition to these markings, separate number 113s are provided in case you wished to do that one, though it is not shown in the instructions. The plane is in late war camouflage of (and correct me if I miss this as only generic colors are provided) RLM 81/83 over 65. 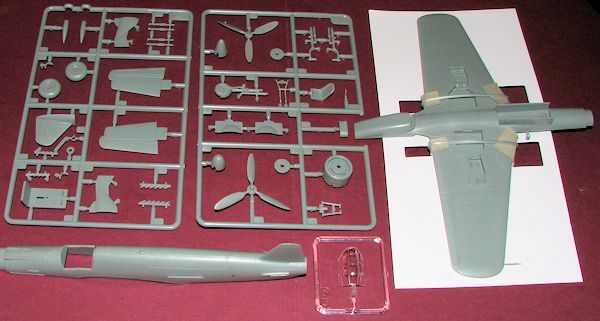 Aside from the propeller issue, it looks to be a very nice kit and I'm looking forward to building it. The instructions do not mention nose weight, but this one will need as much as you can cram into the space in front of the cockpit as it will be very tail heavy. I should also point out that I like that Hobby Boss has been protecting its wing assemblies by strapping them to a section of cardboard. Add to it the wrapping of the windscreen and it surely helps protect bits during shipping. Thanks to Squadron Products for the preview kit. Get this one today at your local retailer.